Smart DIY décor ideas will keep your dream of a fairytale outdoor wedding intact, yeah, without that merciless sun or tower fan spoiling your hairstyle. While the world is going gaga over wedding planners and extravagance, there are many couples these days who want to host their functions in a more intimate manner with selective friends and relatives. So, if you prefer keeping it a low-key event, then a lawn, garden or even backyard makes a wonderful choice. Heck, it could be the back garden of your house! Imagine taking your vows or pheras amidst lush greenery and soothing sounds of the Bulbul, isn’t it romantic? 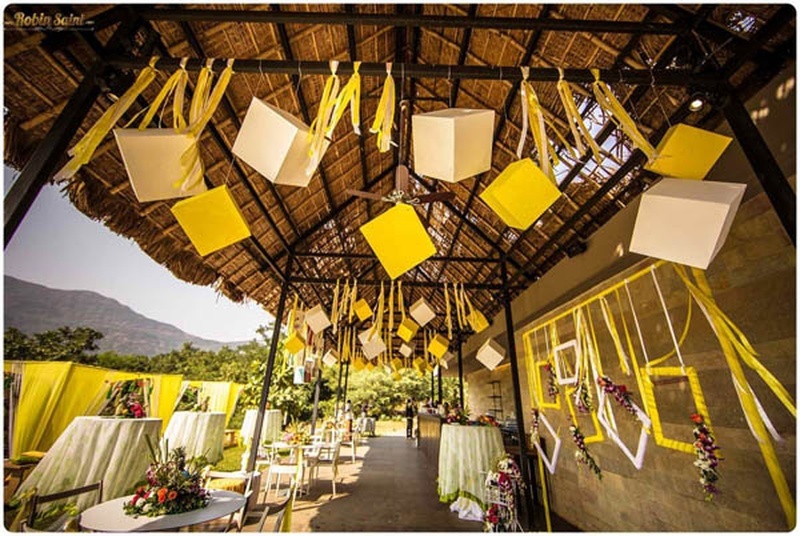 When thinking about décor, you always feel that the budget would rise as decorators charge a huge amount for getting the venue decked up the way you want. DIY décor stuff for your outdoor wedding is a wonderful budget-friendly idea. These décor hacks are perfect for your lawn wedding or garden wedding. Adding interesting and the right light elements in an outdoor space is important if you want your wedding to stand out! Lighting the venue in various ways will add that unique touch to the event you’ve always wanted. Here are a few ideas and décor hacks with which you can create a warm and romantic ambiance for your outdoor wedding. Using wine glasses for tea light candles: Simple wine glasses are great DIY lighting options for an outdoor wedding. You can collect as many wine glasses as you want and use them to keep the tea light candles. An outdoor wedding decorated with such simple yet beautiful lights will create a nice romantic ambience. Easy to do and adorable as well! Fairy lights on tree branches: Fairy lights are the favourites for this season! No wedding décor is complete without fairy lights as they are easy to get and look great as well. For your outdoor venue, you can simply place the strands of fairy lights on the branches of the trees. You can also ask help from your friends and get the whole backyard trees and plants lit up in these beauties! Lanterns & paper lanterns: If you’re hosting your wedding in a lawn or garden, use some strings and tie them over the guests side (you can also use two poles on either side for this) and hang the paper lanterns on them. It will look divine! Or else, take the normal lanterns and hang them here and there with a candle to give your lawn wedding an industrial touch. Tea lights in mason jars: Multipurpose mason jars are always useful in wedding décor. And especially when you’re hosting your wedding in an outdoor space, mason jars are very helpful. Creating a scintillating effect to your wedding by placing tea light candles in mason jars. Yes! Simply place the candles inside the jars and tie its neck with cute ribbons or even threads. Candles: A simple way to light your wedding - Candles! Place small or shimmery candles on the dining table or even on the stage backdrop. The candles can also be placed on the buffet counter and make the space look well lit and warm! Bulbs over the dining tables: It’s not just a barn wedding that looks pretty with bulbs; a lawn marriage also will look fab with those bulbs hanging over the dining tables. It will not only give a rustic touch to the venue but will also add a distinctive class to the wedding. Do make sure that your other décor elements blend with it! You can always add a personalised touch to the guests seating if the wedding is hosted outdoors. If the wedding is a more intimate affair, you can add a customised appeal by DIY for the guest’s seating arrangement. Here we are with a few ideas that will make your boring theater-style seating look more interesting and fun. Ribbon tassels for chair backs: For the guests seating, you can use some nice ribbons and tie it on the backrests! You can use multiple ribbons and let loose the tassels behind for a more beautiful appeal. Coloured matching cushion seats: You can also create a unique decorative look by matching the seat cushions with the wedding theme colours. If you don’t get those cushions, get matching cloths and use them for the cushions by tying them beneath. Romantic tie backs: You can customise the tie backs with the bride and groom’s initials and use them for the guest’s chairs. Interesting, isn’t it? Draped chair covers: You can drape the chairs in simple knots, which will make the setup look more personalised and creative. Flowers always add a charming effect to weddings, so make your outdoor wedding décor stand out with floral arrangements. Beautiful flowers are now in trend and will make your outdoor wedding venue look ‘WOW’. So, it is completely your choice if you want to use faux flowers or fresh flowers for your dream wedding décor. But if you’re using fresh flowers, keep sprinkling water on them or fill the vases with some water. Here are some DIY floral arrangement ideas that you can use for flowers. Wine bottles for flower vases: You can use the old wine bottles and cover them completely with simple, colourful threads or ribbons. It is the most classic way to keep your flowers looking great, adding a nice touch to your outdoor wedding venue. You can collect these bottles from your friends too and also include them in the prep! Jars and canisters: Use the old jars and canisters to keep small flowers like daisies, carnations, roses and lilies. These jars can also be decorated with small sparkling stickers or glitter ribbons. Painted vases: Bring all of your old vases and paint them. Yes, do it! This is also great when you have your friends and family coming together just to do a little more for your wedding. You can hand paint the vases in the colours of your choice and make the flowers stand out! You can have your wedding photo shoots in a stylish way by adding a photo booth that will create a fun and whimsical effect. A photo booth can also have a romantic theme just for the couple in love with a ‘Just Married’ prop for post-wedding photography. Here are some of the interesting things you can add to your photo shoots with the wedding photo booth. Props: You can also make some funny and interesting props for your wedding photography. The best props are made with cardboard, glue and craft paper. Remember this and take ideas from all of your friends and relatives. Props can also include something antique or a whimsical element like a moustache, lips or a ‘chashma’. The choice is yours! Backdrop: Backdrop does not always need to be boring and plain; you can select a wall and stick some pictures and craft pieces on it. You can also make your backdrop by hanging strings and streamers in assorted colours. Vibrant and unique! Adorn the swing with flowers: A swing always looks great for a photo booth, so hang a swing at your outdoor venue. Tree branches are the best option for this idea! Make a simple swing and embellish it with flowers for a more romantic look. It will surely be a lovely spot for your guests to click pictures. Old frames: Make use of old frames to get vintage pictures. It is the most simple and classic photo booth idea to click pictures. Make your guests stand, sit or pose with these frames for those dramatic wedding pictures! Adding a sign board with the details of the wedding day is a good idea to let the guests know the plan of the day. So, if you want to add a unique touch to your wedding, add a signboard at the entryway of the venue. We have listed down some elegant and creative sign boards below. Chalkboard with the couple’s ‘first’ dates: Chalkboards are a lovely inclusion to make your outdoor wedding décor look exceptionally beautiful and creative. So, note the dates of your first kiss, first date, first dinner, proposal and all the lovely memories for your guests to see! It will not just make your wedding décor look beautiful but will also add an emotional touch to the décor. Wedding ceremony signs: Place signs marked on chalkboards of your wedding ceremonies inside the venue and let your guests know where, which ritual will take place. You can also add a classy touch to it by making it look funky with some doodles. Mirror for signs: If you want your signboard to look elegant and classy, choose a mirror instead of a chalk board. Use the mirror to write your signs. You can use wet wipe markers that are available in assorted colours for writing the notes on a clean mirror. You can also choose an antique mirror for a more classic appeal! This DIY hack will add class to your wedding décor. The wedding table spread, drinks, food counter, sweet and dessert table can also get a cool look with some smart DIY tips. Gone are the days where the local caterers and halvais had their table full of Bengali sweets; couples now also include cupcakes, pastries, ice creams and other desserts in the menu with delectable starters and exquisite liquor options. So, why not get the food counter decorated with some cute and interesting ideas. Below is the list of things you can do to make your food table look lovely. Signboard: Your food counter can look more interesting and charming if decorated with cute and funky signs. Not just the sweets corner or the buffet, you can also add signboards on the cupcake holder or the table itself. Make the signboards using cardboard with colourful craft papers and felt tip pens. You can also hang a paper cut sign and hang it on the counter for an appealing yet whimsical effect. This will make your wedding décor look more interesting! Personalised centrepiece: You can decorate your food counter, salad station and sweet station with a personalized centerpiece that is made with the bride and groom’s initials. You can make small, handmade decoratives with the couple’s names and place them on the tables. Also, you can use a multi-tier cake holder and offer some of the best dishes on the counter, making it look visually appealing and enticing! These décor ideas are wonderful and can be done on a budget. With these tips, you can go the DIY way for your outdoor wedding décor. Whether you're into elaborate, romantic archways or delicate DIY wedding decor, these ideas will bring a bit of personality to your ceremony.